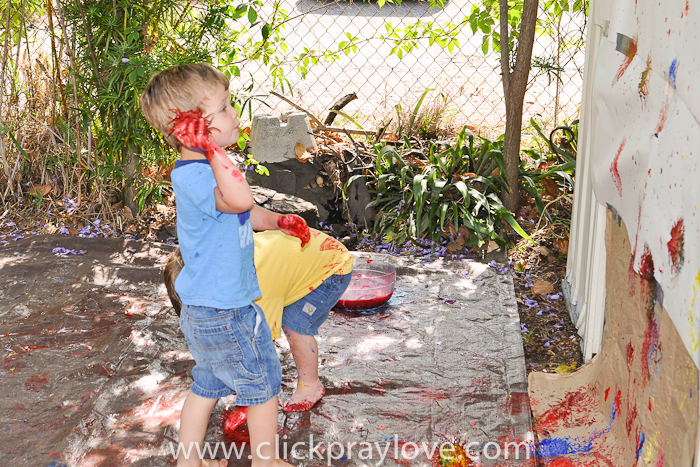 Last year I hosted my first Messy Playdate which I learned about (and gathered ideas) from Crystal of Growing a Jeweled Rose. It had been almost a year, so I decided to plan and host another one. 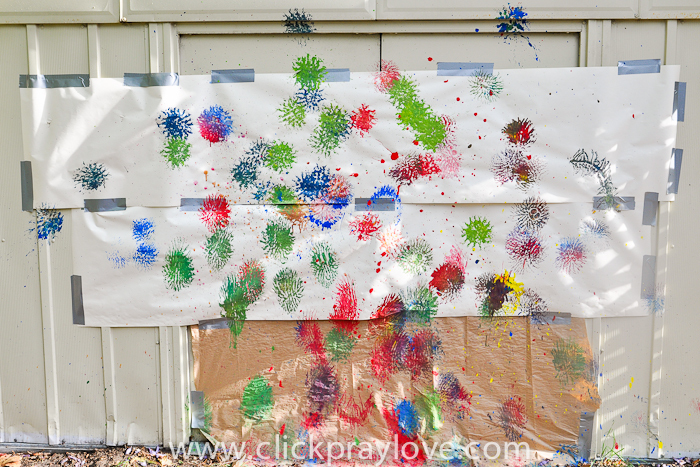 Painting with Balls- Sam and I taped paper to our shed and secured a tarp on the ground. 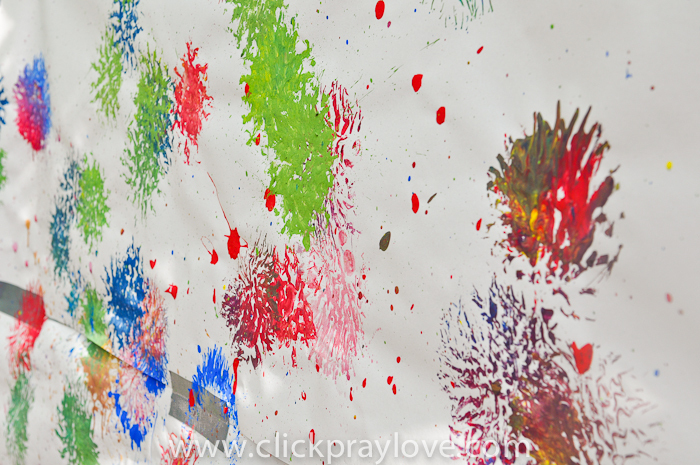 I filled several tubs with washable tempura paint and had textured balls for them to dip and throw against the paper. Construction Rice- A pool filled with rice and Bennett's construction equipment. 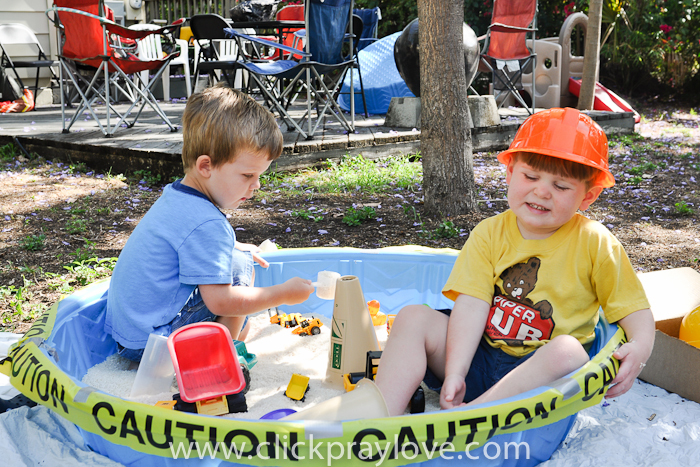 I found construction hats at the Dollar Tree to use, as well. 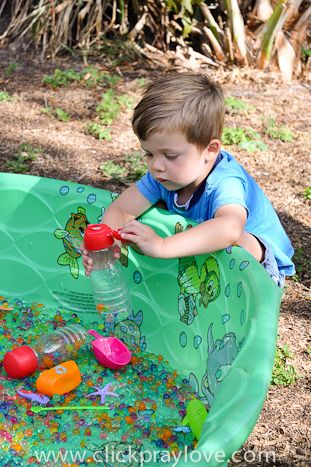 Water Bead Sea- A pool filled with water beads, various plastic sea creatures, and plastic containers. I also had a box with lei's and sunglasses that could be worn. 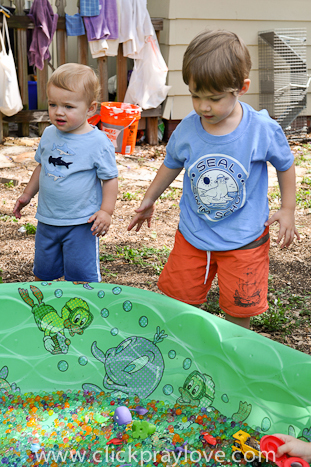 The play date began at 10 a.m. and it was much cooler this year than last year. Several of Bennett's friends were able to come and like last year each family paid $10 to cover the cost of supplies and a small lunch for the kids. 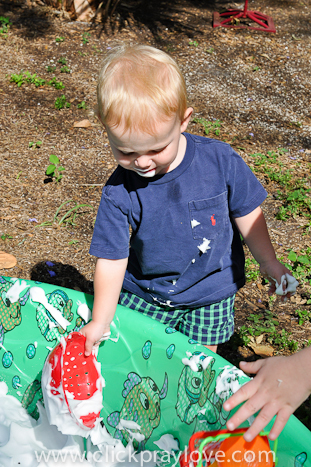 The Shaving Cream Cooking station was not a favorite in the beginning (minus my son), but after a little exploring it became a favorite to many. 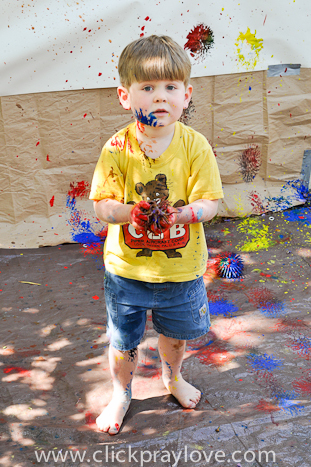 While it created a huge mess that the moms may not have enjoyed ;) the kids LOVED it!! Bennett was hilarious and was quite the host. As people were arriving he would run to each station and tell them all about it. 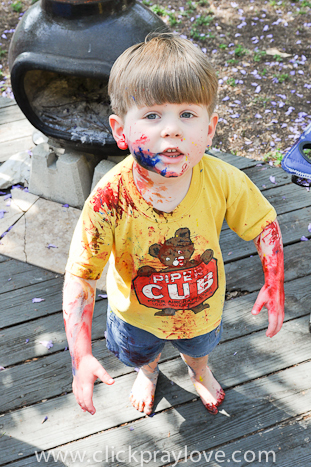 He would say, "Welcome, to the Messy Play Date!" 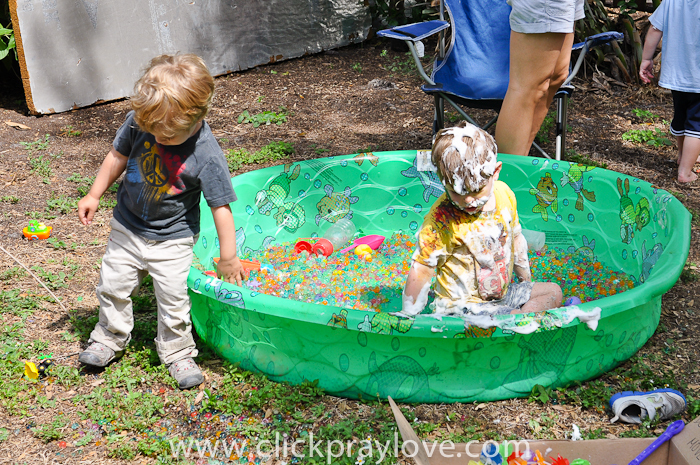 As a whole, I would say the kids enjoyed the water bead sea most of all. 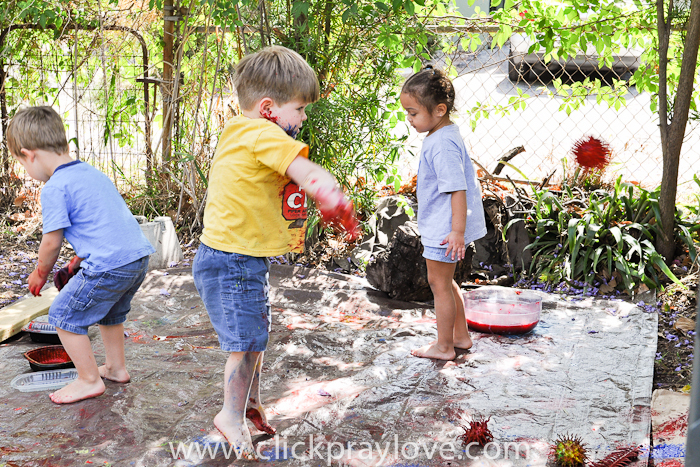 Water beads provide a great sensory experience. I haven't met a kid yet who is not intrigued by them. 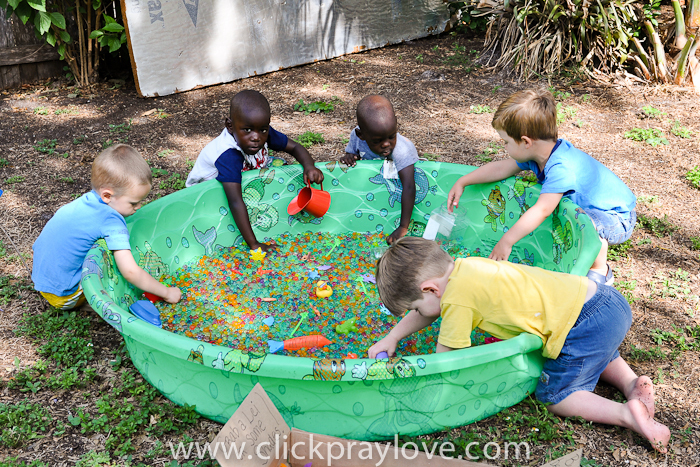 It took about 30 bags of water beads to fill the bottom of the pool. 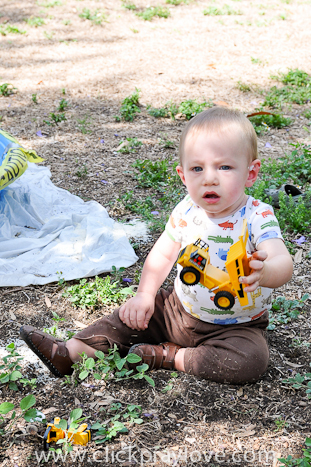 We I see these photos of Bennett and think about how much fun he had I can't stop smiling....and LAUGHing. 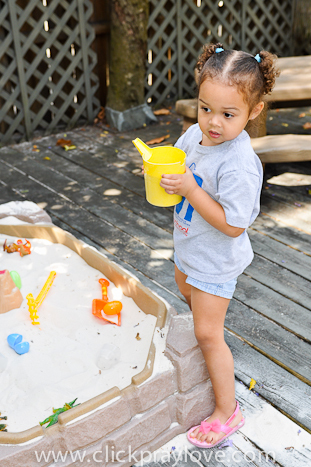 Most children love a sand box. 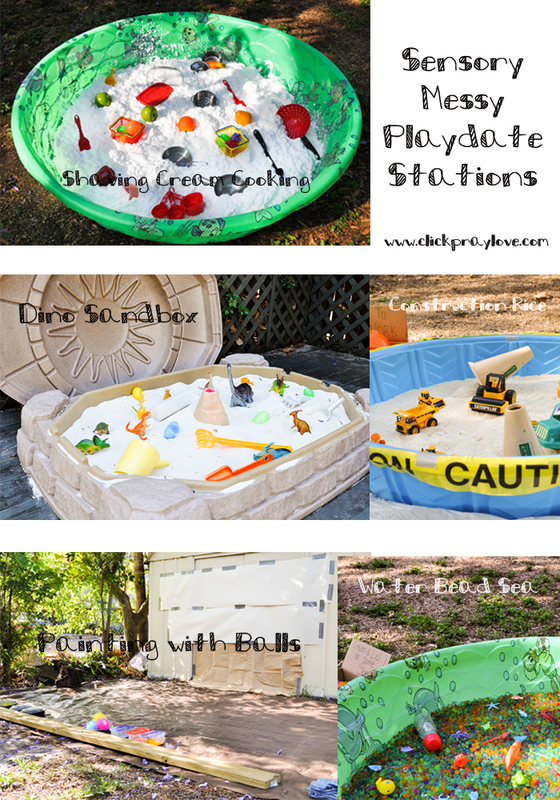 You can simply give them a shovel and a bucket and they will play for a long time, but it was fun to repurpose some of Bennett's toys by including them in each station. 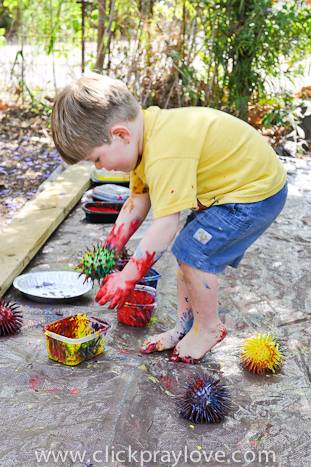 Painting with Balls was a huge hit with my son and Wyatt! Of course, Bennett enjoyed every station as you can see. This station made a huge mess, but it was sooooo worth it. The kids who got into it played for a long time, while the others only spent a few moments and then moved on. The finished product made for some really neat artwork. Last year, the rice station was the favorite, but it took a backseat this year.........at least for the first 30 minutes. Then, the kids were thoroughly enjoying themselves. 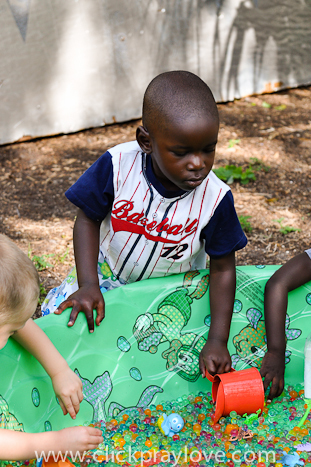 While the set up can be intense it is totally worth it when I see the kids enjoying themselves and am able to converse with some dear friends. Now, that summer is in full swing I am not sure when I will host another one, but I do hope to do it again. 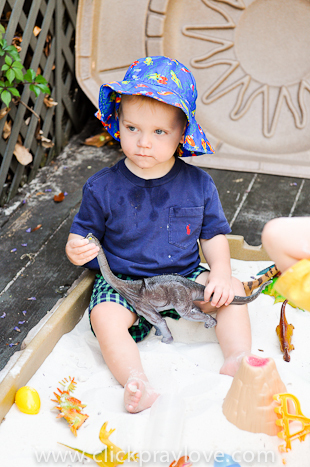 I can honestly say it is the most fun I have ever seen Bennett have (outside of our trips to Disney World). These pictures are great! It was such a fun day! So much fun! 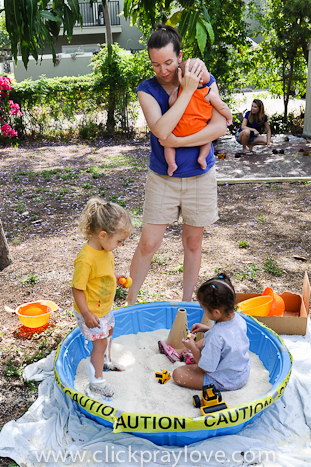 I've never heard of anyone else having this kind of play date, but it looks awesome! Where do you get water beads? I've never heard of them.